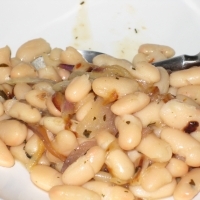 This was an empty pantry recipe - all I had was one small red onion and a can of white beans. Tasty, healthy and filling...it was just what I needed! 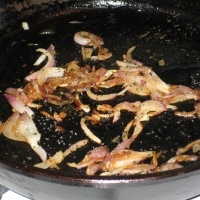 Warm up your olive oil in a heavy bottom pan (I used my cast iron) that will maintain an even heat - keep the heat low as you will be caramelizing these onions slowly to maintain their sweet and mild flavor. 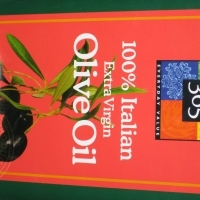 There should be a slight sizzle to the olive oil. 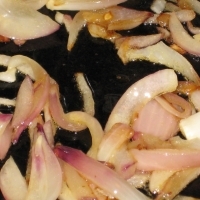 Toss in your sliced onion and stir to coat with the olive oil. Add your salt and red pepper flakes, hold the basil till the end to ensure the most flavor. 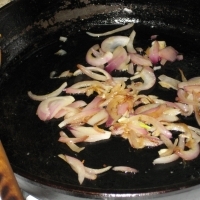 Depending on your pan/heat, your onions should take about 10 or 15 minutes to get nice and browned (make sure you give them a good stir a few times throughout). Crumble your dried basil over the onion and mix well, add more salt and red pepper if needed. 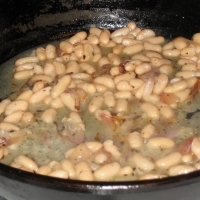 Pour in the beans, stir well. Cook until warmed throughout. Taste one more time and add additional flavorings as needed. Serve with a nice salad and crusty whole wheat bread for a delicious vegetarian meal. I make this all time and it all started b/c of an empty pantry, too! This is great - so simple, sounds fabulous! Like extradirtymartini's recipes? Never miss an upload!